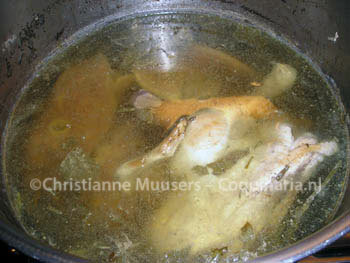 This is the first ‘historical’ recipe for stock on my site. 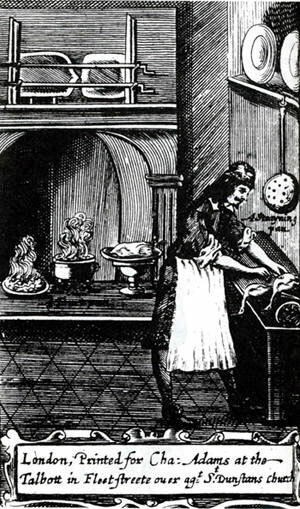 This meat stock is taken from Le cuisinier françois by François Pierre la Varenne, from 1651. It is the opening recipe in the book, a real basic recipe. The stock is made with a lot of meat, and all kinds of it: beef, mutton, fowl. From the advise to keep hot water at hand to add to the pan if necessary it seems that less water was added during the preparation than in modern stock making, or in other words, more meat was used for the same amount of water. Mutton (‘mouton’) is used in this basic recipe. If you do not like the taste of mutton, replace with lamb, or with beef. However, the authenticity of the taste is then lost. There are no vegetables used in this stock, not even onions or leeks. This stock is used in the recipe for ‘Potage à la Reyne’ from La Varenne. There you can read more about the cook and his books.On the picture on the left you can see a print from the English edition of Le cuisinier François, which appeared in 1653 asThe French Cook. Maybe La Varenne’s meat stock is cooking in the cauldron in the middle of the hearth. The recipe is from Le cuisinier François (edition Hyman, see bibliography), pp.1/2. For the English translation I have used for the most part the translation by T. Scully (see bibliography), except where the first and second editions themselves appear to be different (difficult to say, as Scully only offers the translation, not the original text, but even then his book counts 626 pages, so it’s understandable). La maniere de faire le Boüillon pour la nourriture de tous les pots, soit de potage, entrée, ou entre-mets. 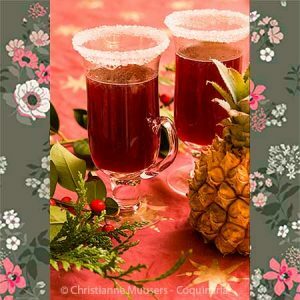 Vous prendres trumeaux derriere de simier, peu de mouton, & quelques volailles, suiuant la quantité que vous voulez de bouillon, vous mettrez de la viande à proportion, puis la ferez bien cuire auec vn bouquet & peu de cloud: & tenez tousiours de l’eau chaude pour remplir le pot; puis estant bien faict, vous les passerez pour vous en seruir. Et la viande rostie, dont vous aurez tiré le jus, vous la mettrez boüillir auec un bouquet; faites là bien cuire, puis la passez pour mettre à vos entrées, ou aux potages bruns. The way to make stock for the enrichment of all dishes, be it pottage, entrée or entremet. You get hind leg and rump of beef, a little mutton and a few fowl, depending upon the amount of the bouillon you want, use that amount of meat. 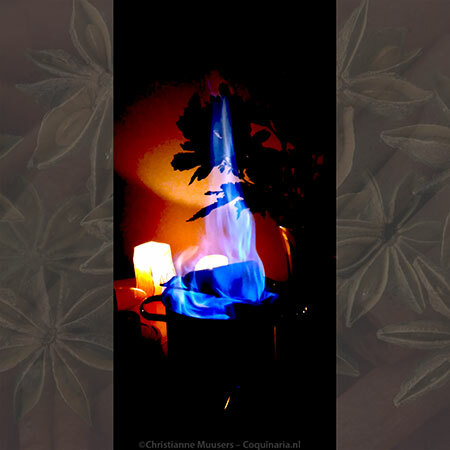 Then cook it well with a bouquet and some cloves. Keep hot water at hand all the time to refill the pot. When it is done, strain it to make use of it. And for roast meat, after having extracted its juice, set it to boil with a bouquet. Cook it well, then strain [the bouillon] for use in your entrées, or for brown pottages. I have chosen to adapt the preparation. Instead of using a limited amount of liquid which is not reduced, I use more liquid and concentrate the stock after straining it. The translation by Scully, which is based on the second edition of 1652, shows that a ‘bouquet’ consists of parsley, chives and thyme (Scully, p.133, see bibliography). Voor 4 liter bouilon; voorbereiding 5 minuten; bereiding 6 uur + zeven, inkoken, afkoelen. Make a bouquet by tying the herbs together. Place meat and herbs in a large pan. Add 4 litres hot water. Bring to the boil and simmer for four to six hours. Strain the stock, and reduce to two litres, then let it cool quickly. Now you can freeze what you don’t need immediately. If you want a dark stock, first roast your meat and fowl for 30 minutes in an oven at 225 dgC/ 440 oF. According to La Varenne you should now extract the juice from the meat, which is described on p.127: Prick the meat with a knife, press the meat to extract the juice. Not everyone will have a meat press at hand. Just take two G-cramps and two firm boards. Put the meat between the boards and turn the cramps as tight as possible. Don’t forget to place a dish under it to catch the extracted juices. If you want to use the stock for potage à la reyne make sure to make it from cooked meat, because the potage should be light-coloured. A French recipe for stock with meat and poultry by François Pierre La Varenne, from ‘Le cuisinier François’ (1651).